Just as there is some variety in the ways in which a wombat spends its days underground, so there is considerable diversity in its nightly activities. Probably the main factors that cause this diversity are the seasonal conditions and the type of habitat; the prevailing weather conditions and the proximity of other wombats, and enemies, such as feral dogs or dingoes or humans, will also influence a wombat's movements. But in spite of the many variations, the wombat's life above ground does follow a general theme and this applies to all three species. The wombat emerges from the burrow, usually after sunset; it grazes for several hours, intensively at first, moving over part of its range as it feeds; it may interrupt its feeding to enter a burrow for rest or refuge; usually before sunrise it enters a burrow for the next day's sleep. 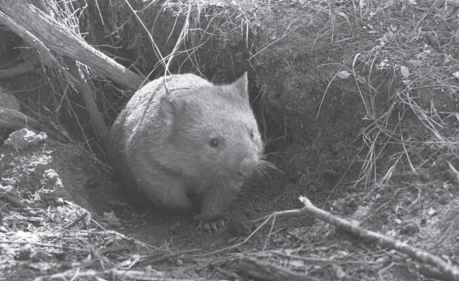 If the temperature and other external conditions are suitable, a wombat will usually emerge from the burrow about dusk. On some summer evenings, when temperatures stay above the wombat's 'comfortable' temperature of 20°C, it will wait in the cool burrow until midnight or even later before emerging to feed. In winter, when food is often difficult to obtain, it may leave the burrow as early as three or four o'clock in the afternoon, particularly on overcast days or after a night or two of heavy rain or snow when little or no feeding has taken place. Wombats suffering from mange are also often seen above ground during the daytime, perhaps because in their weakened state they need more time to find food. After very cold nights southern hairy-nosed wombats often leave the warren in the late morning to bask in the sun. In some regions, where conditions are ideal for wombats, they are often active for many hours in the daytime. 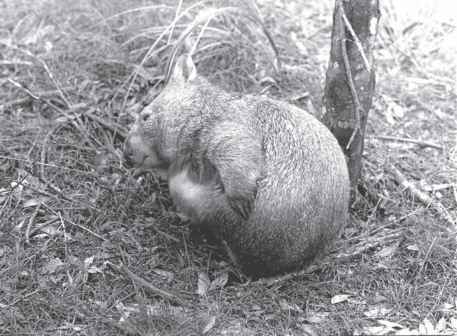 Very high densities of wombats often occur in some coastal areas of north-east Tasmania, where there is sandy soil suitable for digging deep burrows and improved pasture adjacent to dense scrub. Green and Rainbird estimated that one area of 800 hectares supported a population of 1000 wombats; I have seen 40 wombats grazing about midday, spread over an area of about 30 hectares. In the cooler months some of these wombats emerged from their burrows as early as 10 o'clock in the morning. 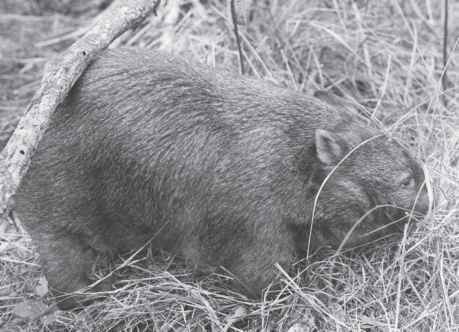 Typically, the wombat pauses in the burrow entrance for a short time, and then moves out (Figure 5.1). Sometimes it then sets off to begin feeding, but often it sits down again almost immediately, either on the mound or very close to it, sometimes stretching out and lying prone for another doze, but more often sitting, head down and still apparently half-asleep. The eyes are closed, or nearly so, while the large nostrils dilate widely as the wombat samples the air. 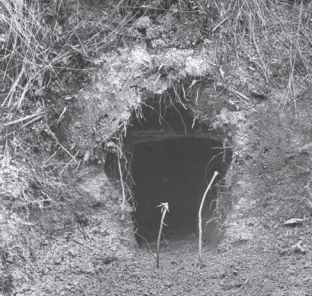 Figure 5.1 After a brief pause at the entrance, the wombat moves out of the burrow. Figure 5.2 Sometimes the wombat halts for a scratch. This investigation can take some time - I have seen a wombat sit for over an hour before it was apparently satisfied that all was in order for it to move off. This decision is made without warning: the seemingly drowsy wombat suddenly stands up and moves off purposefully in whatever direction its pre-examination of the air has decided it to go. Sometimes it travels without a pause until it is a considerable distance away from the burrow, and sometimes it halts not far from it for a scratch or to visit one of its rubbing posts (Figure 5.2). Here a further consideration of the scents and sounds seems to take place, while the back or the flanks, or both, are luxuriously rubbed back and forth against the trunk of a tree, an overhanging branch, a stump or a fallen log. This will leave a film of dust or of moist earth on the rubbing post if the burrow has been dusty or damp, and regularly visited posts often become smooth and polished. The sides of the head and the forehead also are sometimes scrubbed against the rubbing post, but it is the lower part of the back that usually receives the most attention (Figure 5.3). Occasionally during this rubbing session, the wombat will sit and scratch its flanks, or chest, or any other part of the body that needs attention. Figure 5.3 Any convenient log, branch or tree trunk may be used as a rubbing post. Usually it is the lower part of the back that receives the most attention.